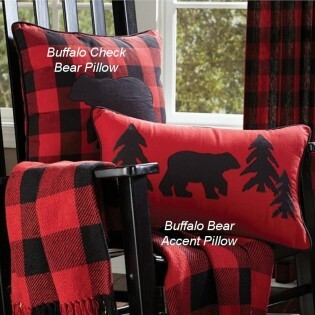 The Buffalo Bear Accent Pillow features a black bear and pine tree design on a red background. This Buffalo Check Bear Pillow features a traditional black and red buffalo check with black bear applique. The Buffalo Bear Accent Pillow features a black bear and pine tree design on a red background. The Buffalo Check Bear Pillow features a traditional black and red buffalo check with black bear applique.